The Launch of a Dream: Life, Love, Mystics, Adventure and the Road Less Traveled in a podcast? I read this pithy proverb somewhere recently and whole-heartedly concur. There are few things I want more in life right now than to do a thru-hike of the Appalachian Trail. Unfortunately, for all my love of spontaneity, I’m also a realist. It’s a mortgage that’s keeping me from that dream and it truly would require an episode of insanity to ignore that fact. I can’t deny, however, that it’s perfectionism keeping me from a dream of another kind. Perfectionism is a terrible, terrible trait. I battle it daily. It’s latest manifestation is in my “failure to launch.” No, I left home years ago. Another kind of launch. A year or so ago a seed of an idea formed, gestated and grew until I knew had to do something about it. The idea was for a pod-cast; a sort of audio journal that would invite others along as I explored this path that has lead me beyond the walls of the institutional church and into the wilderness…literally…into the woods.As I dreamed, I discovered fellow travelers on my journey. Topping a long list are Thoreau, Muir and Annie Dillard. Their writing served to encourage me along the way. I’ve also discovered a company of others who are even now walking the same trail. Maybe you’re one of those. I quickly found that creating a pod-cast was not nearly so simple as I’d imagined. I was constantly realizing that I needed to teach myself to use yet another piece of software and never quite content with the end product. Even now I’m dissatisfied with my Word-press site and struggle to make even minor changes. I tell you this as a sort of disclaimer. If I continue to tweek until it’s “perfect” it’ll never launch. I often hear seasoned AT thru-hikers give aspiring thru-hikers a piece of advice: Don’t put your hike off until you’re ready…or you’ll never go. Just go for it. Nothing wrong with preparation but the little things you haven’t worked out will work themselves out along the way. Good advice. Here’s my episode of insanity! I’m going for it! I invite you into my mess, flaws and all, and hope you’ll enjoy the journey as this thing grows and evolves. It is most certainly not yet what I hope it will become but I think it’ll be fun to watch the transformation. Disclaimer out of the way, who should subscribe (It’s free, by the way!) to All Who Wander? bells and smelling of pepper and wonder if you should be concerned. – You have a long commute. *Most websites feature ads. On our site you’ll find “ads” that are actually affiliate links. We make a little money every time you link to one of our hand-picked affiliates such as Amazon, REI, or Mountain Life. We make even more if you buy something from them! We chose these because we love, trust and buy from them regularly ourselves. My hope is that the pod-cast will become a mixed bag of “audio-hike” field recordings, discussions about gear, conversations with artists, writers, musicians and everyday people like you and I who are discovering what it is to walk with God outside the box of institutional religion…exploring the “thin places”, dreaming of what could be, and talking about people, books, films and music that have helped us along this path. Listen. Enjoy. Tell someone. Give us a review in the I-Tunes store. Patronize our affiliates. 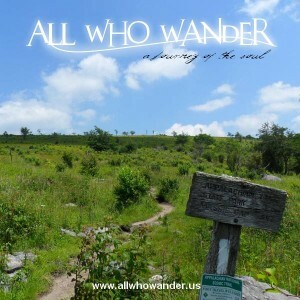 Post a link to an All Who Wander pod-cast or blog by clicking on the facebook button at the bottom of each post. Become a fan of All Who Wander on facebook. Join the conversation by posting a comment at www.allwhowander.us. Let us know what you think or what you might find helpful. Tell us if you know of someone who’d make an interesting guest on the show. (Maybe that’s you!) We really, really look forward to hearing from you! Stand at the crossroads and look; ask for the ancient paths, ask where the good way is, and walk in it, and you will find rest for your souls. -Jeremiah 6:16. Hi David! This is awesome; I’ll definitely be sharing it with my Dad so that he can enjoy it too! As for podcasts, I hope they start sooner rather than later! What a great idea! Thanks, Laura! As for the podcasts, they’re on the site. Episodes 00 thru 003 are already posted. You can listen online or subscribe through I-Tunes. I have two more that I have to find time to do post-production on. Hopefully, at least one of those will be up by the end of the month. Hope you enjoy. When we leaving? I’m thinking spring 2012.